These houses illustrate many design trends of the Federation House, however are not the first to do so. It last sold in 2004 at $3.55 million having previously changed hands in 1997 at $1.27 million. The building should be included in the Heritage Schedule of the LEP and should be protected by the Conservation Area Listing. Subdivision should not occur. Consolidation of sites should not occur. The existing use of the site should continue. One storey, two storey, attic additions could occur at the rear of the building. 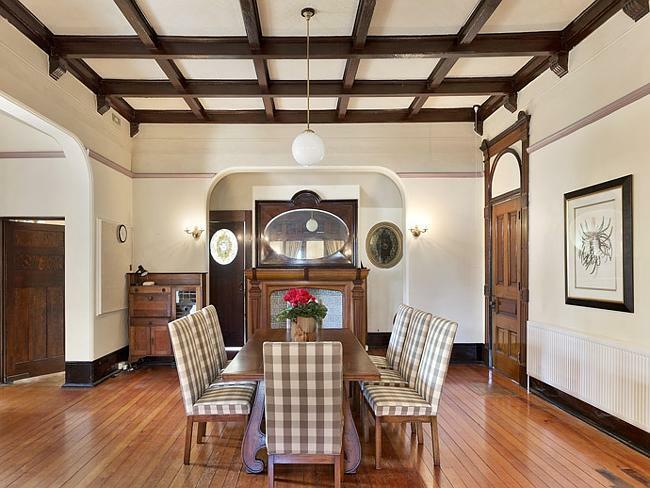 “Oswestry” circa 1887, is a magnificent landmark residence of the Inner West, offering space in lavish abundance with soaring decorative ceilings, marble/timber floors, impressive cedar joinery and dramatic roof lines. Commanding an enviable position behind a security gated entrance, ‘Oswestry’ is a mansion of remarkable elegance and lavish proportion, coupling contemporary luxury with the ornate grandeur of federation Queen Anne architecture. A two-storey freestanding grand residence that dates from the Victorian “boom” period with a 1908 Federation overlay, within the key period of significance, set on a wide site that has retained its context. The façade presents a complex asymmetrical elevation and is constructed of rendered masonry with a paint finish on a rendered masonry base course. The roof is complex and features a pyramidal tower and a cupola tower, clad in sheet metal, a projecting faceted bay and gabled bay to side. The roof is hipped with a medium pitch, gabled with a steep pitch, and has broad, boxed, corbelled eaves. The roof is clad in slate with terracotta ridge capping and features corbelled chimneys, terracotta chimney pots and timber finials. The verandah runs between the towers and has a straight profile. It is clad in sheet metal and features turned timber columns, carved timber brackets and unusual Art Nouveau, cast iron balustrading. The façade features Art Nouveau and classical motifs, garlands, shield panels, pressed metal skirt, timber battened wall finish. The front door is centrally located marked by a portico and is multi-panelled with two glazed panels with fanlights and sidelights and features noveau leadlight glazing. Fenestration comprises vertically proportioned French doors, curved glass sashes to tower and multipane casement timber windows with highlights, leadlight and rendered sills. The building appears to be in good condition and is substantially intact. Most major rooms open to sundrenched terraces, verandahs and perfect North facing, manicured level gardens. One of the finest mansions on Glebe Point. “A magnificent landmark residence of the Inner West, offering space in lavish abundance with soaring decorative ceilings, marble/timber floors, impressive cedar joinery and dramatic roof lines. “The informal entertaining areas incorporate a five star deluxe integrated kitchen (gas and electric), walk-in pantry, butler’s pantry/laundry, exquisite carpentry, marble benchtops and marble floors (heated) plus European appliances. The spacious family/breakfast room flows via French doors to a superb North facing terrace and private manicured level gardens. The building has historical significance for its ability to evidence Federation development. It is an important building in the professional work of the noted architect Oliver Harley. The scale and quality of the building and site reflect the aspirations of the early occupants of the Toxteth Estate. Significant for its association with the development as a transport node. The building has historical associative significance for its association with the original owner, FE McMahon and the subsequent owner in 1905 Mr Benjamin Esq and his architect Oliver Harley. The building is significant for its contribution to the streetscape and to the Toxteth Estate. The site and building provides evidence of the early subdivision of the Toxteth Estate. One of the finest mansions on Glebe Point. The building has aesthetic significance as an outstanding example of transition from Victorian to Federation Style. It has a high quality of design intention and is particularly noted for its use of the round tower element. George Allen (of Toxteth Park) during his lifetime had acquired 96 acres of the Glebe lands. Allen and his son died within four years of each other and it was at this time that the estate began to be broken up. The subdivision and sale of the Toxteth estate began in 1884 and by 1914 the process of building up this estate, lying between Wigram Lane and Victoria Road on the one side, and between Glebe Point Road and Harold Park on the other, was virtually completed. During this intensive building phase, Joseph Walker and Thomas Sinclair constructed a large number of the Italianate villas and cottages in Glebe Point, Toxteth, Arcadia and Avenue Roads. Ausin Group managing director Joseph Zaja, the salesman who has sold more Australian property to the Chinese than perhaps anyone else, and his wife Sarina have emerged as the buyers of the historic Glebe home Oswestry. Zaja, who helps wealthy Chinese buy property in Australia, paid $6.25 million earlier this year for the landmark 1880s home. See also post Queen Anne or Federation Queen Anne? A sale of more than $3.5 million was tipped by Jennifer Aaron from Jennifer Aaron Real Estate. One of Sydney’s grandest and most distinctive properties has hit the market for the first time in three decades. Amesbury is a grand 10-bedroom Queen Anne-style mansion on a 1366sq m block in Ashfield and is primarily recognisable by its four-storey Romanesque belfry-style tower. 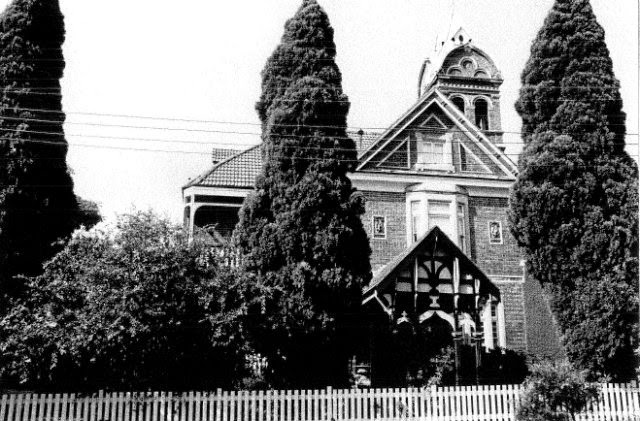 While it appears to bear all the hallmarks of a church, it was designed and constructed in 1888 as a house by renowned Australian engineer, Norman Selfe to celebrate the country’s Centenary. Ashfield’s most significant historic home. ‘Amesbury’ is a grand 10-bedroom Queen Anne style mansion built in 1888 by Mr Norman Selfe (1839-1922), Australia’s foremost engineer during the late 19th and 20th centuries. Last traded 30 years ago, the landmark residence was designed and constructed by Selfe during an era when engineers were regarded far more highly than architects. Upon completion, ‘Amesbury’ was considered the ultimate modern showpiece; it was feted in ‘Builder and Contractors News” as presenting “more novelties both externally and internally than any other house in the colony”. With an elite pedigree of timeless distinction and historic significance, ‘Amesbury’ is a magnificent example of a wealthy Victorian gentleman’s family residence. Distinguished by a four-storey Romanesque tower with north-easterly views to the harbour, ‘Amesbury’ retains a host of beautiful internal and external features, including white Canterbury stone window surrounds and a pair of terracotta lyrebird panels modelled by decorative artist, Lucien Henry. The distinctive four-storey Romanesque tower was tailor-made for Norman Selfe’s hobby of astronomy, complete with terracotta lyrebird reliefs by artist Lucien Henry on the front wall.The distinctive four-storey Romanesque tower was tailor-made for Norman Selfe’s hobby of astronomy, complete with terracotta lyrebird reliefs by artist Lucien Henry on the front wall. The distinctive four-storey Romanesque tower was tailor-made for Norman Selfe’s hobby of astronomy, complete with terracotta lyrebird reliefs by artist Lucien Henry on the front wall. The dining room has mahogany beamed ceilings and oversizes panel doors. It does have a spiritual connection though, having been owned by international peace and meditation organisation Brahma Kumaris Raja Yoga since 1986. Upon its completion, Amesbury was considered the ultimate modern showpiece. The Australasian Builder and Contractors’ news even described it as having “more novelties both externally and internally than any other house in the colony”. Selfe’s international travels during 1884 and 1885 inspired much of the design of the home. For the exteriors, he discarded cast iron lacework in favour of distinctive timber balustrades and carved fretwork. 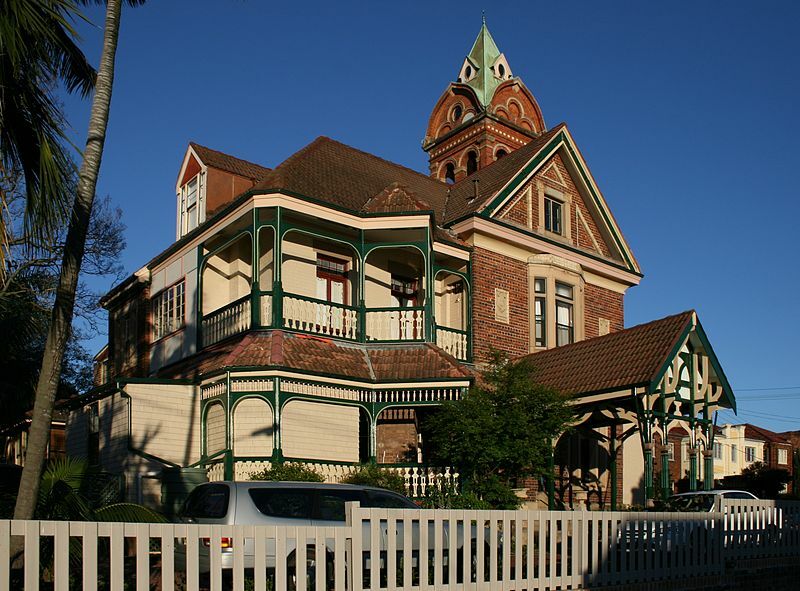 “Designed by respected local architect Frederick Menkens and built c1895 as a family home for prosperous spirit merchant Joseph Wood, magnificent ‘Braeside’ is one of Newcastle’s longest standing examples of Queen Anne Federation architecture. “Beyond the magnificent gardens containing a circular driveway once used for horse drawn carriages, the perfectly preserved facade is resplendent with all the traditional hallmarks of its era including corbelled brick chimneys, an unusual Dutch gable and an encircling verandah. “More than any other man, he shaped Newcastle through his landmarks. The Mosman home was sold by former Olympic sprinter turned television presenter Matt Shirvington and his wife Jessica. The champion sprinter-turned-Fox Sports presenter first listed the Canrobert Street property in 2011 and kicked off another campaign earlier this year before McGrath’s Michael Coombs and Claudia Portale took over the campaign. Built in 1897, the striking four-bedroom Federation Canrobert St residence was beautifully restored in 2010 and includes a host of classic features throughout, such as original pressed metal ceilings, leadlight windows and formal living areas adorned by fireplaces. Probable Art Nouveau leadlighting in bedroom bay window (not well-illustrated) but no leadlight in the front door surround. According to CoreLogic RP Data records, the Shirvingtons paid $2.5 million for the property, which they share with their daughters, back in February 2008. It’s not the first time they have taken the home to market since, having previously listed it in September 2012. Steeped in refined c1897 details on a large 822sqm corner block, this meticulously updated Federation home presents a spacious single level layout embraced by child-friendly gardens. It’s set within metres of Mosman Village, exclusive schools and transport. History has been graciously intertwined with modern living in the most sophisticated way. Kumdibar (1898) is a breathtakingly beautiful example of early Federation architecture lovingly revived to its former grandeur. The stately residence is nestled among 2,934m2 (approx) of impeccably manicured formal grounds, complete with a championship sized tennis court and pool. The home contains five bedrooms and three tasteful stone bathrooms, the main with a spa bath, including an expansive master wing encompassing a travertine ensuite and a dressing area. Kumdibar’s ornate classic details have been lovingly brought back to life or replicated, creating an atmosphere of enduring elegance, with double brick construction ensuring solid bones. As you enter the residence you are greeted by an extra-wide hallway with an impressive archway heralding your arrival. Soaring 13 foot ceilings are enhanced by ornate cornices and picture rails, while whitewashed timber-panelled walls, a slate roof and parquet floors are a nod to its heritage. The wide verandah which wraps around the home is finished with original sandstone, still in impeccable condition. Kumdibar’s traditional features are enhanced by a host of modern touches for your comfort and enjoyment. The residence has been newly painted and carpeted, with the traditional Federation interior colour scheme replaced by a palette of cool grey tones adding a calming contemporary sophistication. Elegant cabinetry has been custom-designed to reflect the home’s traditional air. Additional details include a security system, plantation shutters and ducted air conditioning to keep the surroundings temperate year round. The grounds are professionally lit and irrigated. Gowrie, a Moonee Ponds trophy home, has been listed for sale with $4 million plus expectations. Gowrie sits on a 1525 square metre Ardmillan Road block which comes with a large rear garden with pool.. It is a showpiece Edwardian residence, rich in period detail. There’s four bedrooms, two living zones and two dining areas. The home was owned by football champion Wayne Carey when sold at a record $1.15 million in 1999. It traded at $620,000 in 1995. The Kangaroos captain owned elsewhere on Ardmillan Road selling in 2000 for $530,000 having bought for $420,000 a year earlier. One of Moonee Ponds’ finest homes, this landmark Edwardian showpiece delivers an aspirational lifestyle of period grandeur, contemporary luxury and family versatility surrounded by landscaped gardens on approximately 1525sqm of land. A level of opulence and elegance rarely seen, the home’s breathtakingly-beautiful interior boasts a grand central hallway accessing four large bedrooms (master with private ensuite), main bathroom with spa, guest powder room (third WC), stately formal lounge and dining rooms. Other luxuries include hydronic heating and ducted refrigerated cooling, extensive home automation (lighting/blinds/audio-visual/gas-log fireplace/cameras at front and rear), towering ceilings with ornate plaster detailing, integrated climate-controlled cellar and so much more, plus an expansive north-facing backyard with entertaining patio, gas-heated pool, large storeroom and double garage via gated driveway (both remote-controlled). Hartford (on the subdivided Toxteth Estate) was built for dentist E Randolph Magnus (his preferred name), the driving force behind the establishment of Sydney’s Dental Hospital. Hartford’sfeatures included multiple public rooms, two bathrooms, five bedrooms plus a nursery and servants’ quarters (Protestant ‘help’ included a housemaid, general servant, parlour maid, cook and laundress). During the Magnus family’s occupancy gardens and lawns were established, a conservatory and bush house built, and a croquet court laid out. In 1907 Hartford, together with its specially made and bought furniture, was offered for auction. The ‘artistic modern residence’ at 244 Glebe Rd was finally purchased by the Levy family who had moved in by 1910: Henry ‘Harry’ Phillip ‘of independent means’, his brother Joseph Angel, a wholesale jeweller, Joseph’s wife Elizabeth ‘Lizzie’, and Basil Angel, in adult life a partner in his father’s jewellery business. ‘Hartford’ is a stately Federation mansion in a fabulous harbourside suburb. It offers grand scale family living and entertaining in a quiet village setting. Built in the 1890s for Scottish medico E. Randolph Magnus, the Kennards bought it from recruitment executive Randall Maple and his wife Erica Maple-Pols. They secured approved plans for a contemporary conservatory at the rear by architect Otto Cserhalmi. The Kennard’s listed through McGrath agent Michael Glynn who expected it to fetch about $4.5 million. Title Tattle gleans $4.2 million was secured. The Queen Anne mansion Hartford was sold by the yoga devotees Jim Kennard and his wife Ananda Kennard in 2015 only 19 months after they bought it for $3.85 million, with plans to move to the United States. ‘Hartford’ was owned by the Presbyterian Church until a sale to private hands occurred in December 1998 for $1.52m. According to publicly available records, the home last traded hands in April 2006 for $3.24m. Hartford is an outstanding example of a Federation Queen Anne style grand house, with Art Nouveu detailing, in a garden setting. It is stylistically related to 242 Glebe Point Road and together they make a strong contribution to the streetscape. The building’s size and quality reflect the development of Glebe Point Road as a prestige address and the aspirations of the Allen family and the early residents of the Toxteth Estate. Hartford reflects the social importance in late nineteenth century Sydney of English cultural references and Scottish baronial architecture. The building has historical associative significance for its association with the dentist, Dr E Randolph Magnus. A freestanding Federation Queen Anne style grand house set on a wide corner site that has retained its context. It reads as two storeys but also has a lower ground floor level. It is set on a wide corner site at the corner of Glebe Point Road and Park Avenue that has retained its context. The building is set back from the street with front fence of stone-capped face brick on a stone plinth with cast iron quatrefoil motif panel. The front garden is large and informally landscaped and features a central concrete path, mature trees and provides an appropriate setting for the house. Soaring pressed metal ceilings, stunning original fireplaces. The façade presents a complex asymmetrical elevation and is constructed of tuck pointed face brick timber shingles and rusticated stone panels. The roof is complex and gabled with a steep pitch, and has broad timber-boarded exposed eaves. It is clad in terracotta tile and features tall corbelled brick and rough cast chimneys with terracotta chimney pots and conical turrets, gabled ends, shingled and timber fretwork. The verandah runs across the corner and above the entry and has a straight profile. It is clad in terracotta tile and features turned timber columns upstairs and tapered painted stone columns below. Other features include a delicate turned timber valance and balustrade, shingled skirt, tessellated tiles and slated edging. The façade features highly decorative carved stone panels and carved stone corbels and sills. The front door is centrally located and is panelled and glazed with fanlight. Fenestration is varied and comprises vertically proportioned arched casement timber windows with highlights, some leadlight and an oval-shaped window to the verandah. Fenestration to other facades is double hung timber sashes. Internally significant features of the main house include the original room layout, timber stairs, timber joinery, brass hardware, decorative ceilings, fire places and leadlight glazing.